gooood Interview NO.12 introduces Kongjian Yu| Turenscape. More: Turenscape on gooood. Kongjian Yu has design a huge amount of urban and landscape project in China, finished 15 publications during the last 20 years. 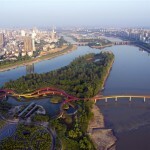 He contributed to establish discipline and ensure the legal position of landscape architects in China. Is there any limitation regarding the scale for the landscape projects which put ecological infrastructure planning and design approach as the core? 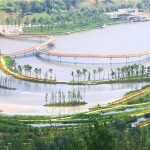 Most Turenscape’s Sponge City projects are over 30 hectares, is small-scale ecological infrastructure project meaningless? My balcony could be part of the ecological infrastructure. In fact any land surface can contribute to the system, as long as the rainwater falls on it. Successful collection and preservation on-site will highly reduce the chance of potential flooding. The ecological infrastructure system does related to the scale of the project, but if doesn’t mean small-scale projects have nothing to do with ecological infrastructure approach. 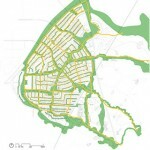 Of course, an overall master planning including ecological infrastructure system is essential. Without serious consideration, ecological-related designs such as storm water management, biological conservation and native species conservation and utilization can rarely be seen in the previous planning of urban green system. If all these are included in the control regulation, legally speaking we have the right to realize ecological infrastructure systemic planning, to transform it into an ecological boundary line and delimit it in the city. Meanwhile, we need to realize it is a complementary part of urban spatial management. It needs to be reflected in urban design regulations, in architectural-related designs – the façade, the roof garden, the architecture itself, the chosen materials may all influence the eco-environment of the city. Urban design, which is more about public space in the current urban context, is an important part in US landscape design industry. 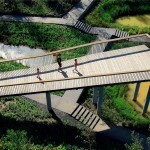 Although it does overlap with architecture design, it is the landscape architect’s responsibility to solve the puzzle. Modern landscape architects should involved more positively into urban design, into the design of public space, and integrated ecological context into it, for example permeable garden or green space, utilization of native species, usage of low-impact materials. We need to improve both in planning and design. Planning is specifying the area of ecological design while design is deciding the materials, forms and the way of integration, which would be realized in all spheres and scale of a city. The construction of ecological infrastructure is both expensive and time-consuming, therefore without the support of policies, it would be eliminate immediately once the project stuck in schedule or budget problems. How did you convinced you cliend? As we know from you book The Road to Urban Landscape: A Discussion with Mayors, you started educating the governors in 2003. 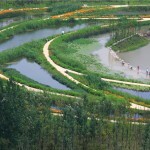 So how can landscape architects bolster their negotiating position when proposing the ecological infrastructure approach? Ecology is rather A necessity than luxury. The elimination only means the landscape architect did not integrated ecological strategy into the design; otherwise it would be impossible to do that, even a chosen tree species has its ecological meaning. Ecological design does not necessary to be expensive, it could be cheaper and simpler, which is proved by Turen’s projects. It could be low-maintenance, low-cost, or even productive, harvesting with crops. It could clean up the water, solving flooding issues. There is a misunderstanding of the intervention of ecological strategies. It would not increase cost at all. Economical, environmental-friendly, beneficial to humans are the nature of ecology. Of course sometimes, because of the different value and aesthetic, the client may not able understand the eco-oriented design at all. For example utilization of local species is the key to natural eco-design but the client may insist on using peony. As landscape architects we can improve ourselves in two aspects. On one hand we need to truly integrate the eco-strategies into the design, and make sure it is not related to time schedule or budget. On the other hand, we need to spread the idea, changing the value of the client, the society and especially the decision maker. Establishing a new aesthetics may be the only way to make our society, our city and nation more environmental friendly. For instance, cycling is greener than driving, so designing cycling track in the park or along with the road is in fact a conflict of values. Then it is not up to the landscape architects to make the decision, the whole society has to stand out to advocate ecological civilization. I emphasized again and again that landscape architect is not artisan, artist or professional technician. We need to get in touch with the society, and change the value of it. That’s why I sometimes show up in the public media to transmit the ideology besides publishing papers. We have been promoting Sponge City Solution for nearly 20 years and finally transmited it into a national action that would potentially be realized across the country. Sponge City Solution, it is not a technical words and understandable by the public. So it changes the value of the public and society, it changes the way we conserve water, and it may change our tradition of landscaping, to make the landscape as sponge. This is an example to educate the public and more importantly, the decision-maker. 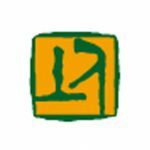 Landscape architects are located in a relatively powerless position in China, but with the help of the administrative decision system to spread the idea, we can make the voice of the industry and every individual in it heard. As the concept of the Sponge City Solution spread across the society, soon the eco-oriented design will be part of our life. It seems Sponge City Solution is now a standard configuration of planning, do you think it might potentially push the city toward another extreme? 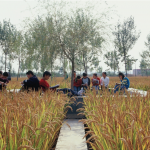 Considering the diverse natural landscape and climate condition in China, how does the approach adapt to the local condition? And how does Turenscape respond to the the situation? Stormwater management turns the rain water into resource for irrigating the land while utilizing natural systems such as green space, park and wetland to prevent flooding, reduce soil contamination and replenish groundwater. Unfortunately because of the backward development of the discipline in China, our anti-ecological regulations have never been updated in the past few decades. For instance the regulations of urban green space once emphasized that excess street runoff cannot flow into the parks, which is completely against the current ecological concept. Another example would be the green space along the sidewalk, which was raised for planting. It needs to be irrigated in the sunny days while can not absorb any water during the rainy day, the ecological function is missing. In this case, one must rely on the administrative power to change the situation. The outdated or wrong knowledge were transformed into regulations through the administrative power so this is the only way to correct it. The development of the discipline is supposed to be boosted by science, the landscape association, regulations of the industry or communications among different association. Yet the futility of the association force the landscape architects to turn to the administrative power, hoping to change the incorrect knowledge structure and methods by it. Would that be a problem? Yes, it will. It may end up with an exact same design regulation for the resilient city development across the nation. That’s why we have to emphasize the importance of site-specific design. For example the precipitation varies across the country, from humid, semi-arid to arid. Rain season in the southeast coast brings huge amount of rainfalls so flooding is the main problem. Meanwhile in the arid west area, rainwater needs to be collected and stored for irrigation. The concept of Sponge City Solution covers both aspects, absorbing water in the area with excessive rainfall while collecting and releasing water in area with limited rainfall. It derives from the dominating concept of resilience city and is a way to realize it. When we design landscape we are actually designing a sponge enriching the city with resilience. 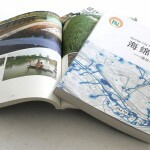 I listed practical designs in different areas of Turen in the book Sponge City: Theory and Practice, among North China Plain, Northeast China, Yangtze River delta, Pearl River delta, Shandong Peninsula, Southeast Coast and islands. As a matter of fact, over 1300 projects Turen designed during these years are all more or less related to the concept of Sponge City Solution, and the concept was modified according to the local situation. 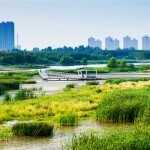 Take Harbin Qunli Stormwater park as an example, Harbin is located in a relatively low land especially the new district. 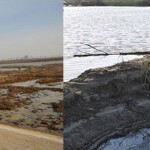 During the construction a 33 hectares low – lying land was preserved to response to the flooding issue on-site. In a place with averaged annual precipitation no more then 1000mm like Northeast China, 10% area is enough to detain the rainwater of the whole site. But in cities like Wuhan with averaged annual precipitation over 1500mm, one storm could drown the city. In such cities it is impossible to detain all the water on-site, so we need to design a comprehensive water management system to reduce the flood peak, to clean, filter, slow down the flow before drain it away. In arid city like Liupanshui, the main target is to detain rainwater, to extend the period with water for irrigating the urban green space, creating a space for public while cleansing water. Based on geographic information, we developed a series of terraced wetlands and retention ponds to slow and filter the water flow. In short, our projects are site-specific. The detail design of the “Sponge System” is modified according to the climate, precipitation, typology and the location in the city. It would never be the same. You proposed Negative Approach of Urban Planning which challenged the traditional city planning. In your theory, ecological infrastructure is planned ahead of other urban structures and therefor become as a whole. As currently the urban development started to convert from expansion to regeneration, what is the opportunities for landscape architects? The concept of Nagative- Planning airsed in 2002. The city was rapidly developing by time. The developers bought the woodland, wetland and lake area with best quality away in one short day, even before a master plnning. What can we do? I anxiously came up with the idea of Negative Planning. Rather than the conventional planning we should firstly have the negative planning list of the city and the territory – which area should not be built and which area should be preserve immediately. It doesn’t cost much time, I might finish it in a week. In this way our city may end up with more flexibility and resilience. If the discipline was well prepared by then, we could do much better than now, and our city could performs in a better way. However as we all know, the city is very sick, with city disease, pollution, congestion, especially flooding and soil contamination. It is the result of the lacking of negative planning; we lost the most sensitive and critical natural system. In fact if the location of the city is properly chosen with certain amount of water surface and wetland, the flooding issue would not even exist. Do we still have a chance? Yes, of course. And for me it is much easier to achieve a good result than before, as the “Sponge City Solution” is widely promoted and accepted across the country. So now, we are facing the challengings from other main disciplines such as Water Engineering, Agriculture, Environmental Engineering, etc. Since the hydraulic engineers did not realize they are making mistakes and that eco-hydraulic engineering is the future of the discipline. We, as landscape architects, need to take the responsibility and includes hydraulic engineering and agriculture into our design as soon as possible. It explains the reason why we did some agricultural relating projects, introducing it into the city while transforming it in a more eco-friendly way. The ancient agriculture mitigated flooding. 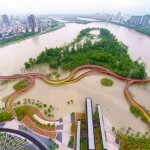 Landscape architecture should not forget its past, expanding again beyond city to tthetory, mitigating the flooding issue. It is a tremendous opportunity and I believe in it. 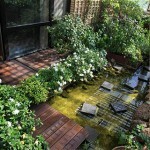 Landscape architecture was in fact developed from civil engineering in USA. Now it is time to return and modified it with the innovative concepts, be brave enough to involve into the hydraulic projects. We need to restore the country land rather than only the cities, and to reconstruct the beautiful landscape we once have. It is a tough challenge but it is also the ultimate goal of the discipline. We have missing out on a lot, but it is better late than never. Take action as we realize the problem. I mentioned the reconstruction of the beautiful landscape and we need to consider it systemically, but for whether we could fulfill it systemically is another story. We have to get the vision, a proper, maybe romantic imagination, and starting to realize it. Anything we successfully accomplishing would be a triumph. I am holding a positive attitude towards it. I do think we can achieve at least some of the overall goal. Just like the “Sponge City Solution”, “Reconstructing the beautiful landscape” would be another nation-wide action in the future, and it is the landscape architects who are responsible to realize it through considerable design. Red is a unique and challenging color. It requires thorough consideration in specific situation therefore we used it abstemiously. To be honest it turned out to be inappropriate used sometimes even in our own projects. Yet still, it is one of my favorite colors and it represents China in a way. On the other hand, as the contrasting colors to green, it amplifies the result of the intervention. Take Qinhuangdao Tanghe Park as an example, with one simple red ribbon, we integrated a significant cultural element while preserving the nature. 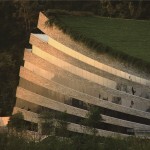 Art is an essential part in a landscape project, which could not be eliminated. So is it Turen’s characteristic? I think if it developed systematically from something you believe in, then it is. We used red box, red ribbon, red origami and red sticks in Xishan Park, these indeed strongly suggested itself was done by Turen in China. But we are far more than that, our projects are various from one another. And what is your opinions regarding the traditional Chinese landscape that embedded the concept of “Unity of Man and Nature”? The traditional concept of “Unity of Man and Nature” is more a psychological concept than a physical one. It is about connecting our life styles with the nature, which is not related to ecology at all. The problem our country facing now is an ecological one. That’s why in Turen’s projects we emphasis the way to balance human activities and nature. It has a more contemporary significance. Of course, with appropriate scale and diverse landscape features it creates rich spatial and visual experiences. The fluidity between the various spaces allowing freedom of movement characterizes the traditional Chinese garden. However applying this approach onto urban space is definitely inappropriate. We are dealing with issues in a large scale instead of creating an interesting space. You are a revolutionary in landcsape education, what do you see as the critical shortcomings of the existing education system? How can we improve it? 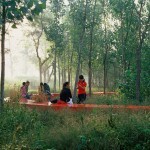 The landscape education in China is misleading. They are teaching gardening in the name of landscape. Chinese garden has a long history and it is very different from contemporary landscape design. Garden is an art constructed according to personal preference. In contrast, landscape focuses on the relationship between people and environmant. It aims to sovle social problems which could not be controled and limited in manmade garden. 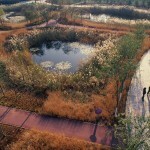 Landscape architects should make good use of natural system to balance city activities and natural process. 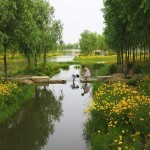 Landscape and garden are totally different subjects and it is necessary to differentiate them. 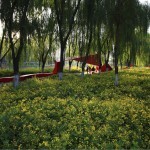 Many people do not understand what is landscape design from the beginning. Even in the national landscape education system it is confused with gardening. However they are totally different subjects in western education structure. It is important to make a clear defination of landscape and separate it from gardening. 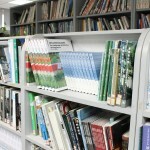 A serious problem for Chinese landscape education is the shortage of teacher. 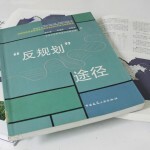 Landscape education is booming in China and landscape department appeared in 200 universities in a short time. However, only a few teachers know how to teach landscape design correctly. It is necessary to gather a bunch of professional people in order to foster young designers who really understand what is landscape design. Otherwise it would only enjoy an empty name. There is a long way for Chinese landscape education to go. What are the structure, culture and working ways of Turenscape? How do you ensure the design principles are applied to every project? Is any project finished with regrets? Turenscape is a passionate and creative design company. Our design team is young and the office is like a school that people work in small groups of different departments. 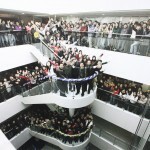 The structure of our company is similar to a school indicating that we are teaching while designing. We learn from each other as well as the invited lecturers and interns form aboard. It is an active working platform. Our design principle is to seek for the harmony of all spirits and we are trying to apply this idea to every project. I keep communicating, discussing and learning from different project teams. We need to stay creative to be able to deal with the 300 projects every year. Communication is a main characteristic of Turen’s projects. We hold discussion twice every month, not only within one department, but also encourage interdepartment communication. Not every project is satisfying, but we could learn from failure and trace on the project to maintain our design principle . We want out project to be a template for other designers that they could copy and learn from. For instance, our idea of sponge city has been a model for many places. We feel that in some sense, it is not bad that people copy our design. It proves that our design is acceptable for the sociaty and we could improve the whole industry by promoting ourselves. 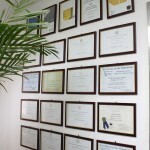 Turenscape is more than a landscape design institute. We also make architecture as well as urban design. In fact we are liscenced in architecture, urban design, territorial planning and tourist planning. No matter how different the project scales are, the fundamental principles are the same, which is merging our idea of people and ecology into design. What are you recently focusing? What is your next step? We are doing a lot recently. First we are summarizing and publishing our works and this is what we have always been doing. Turenscape has been working for almost 20 years and gained rich experience in design. We have developed unique design methods and techniques during work and wish to share and communicate with others. 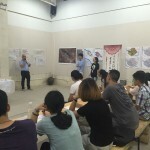 By showing our projects to the public, there would be a number of designers who could solve China’s landscape problems in Turen’s way. Sencond we are running schools. 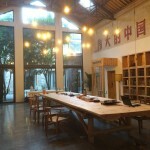 Besides college of architecture and landscape Faculty in Beijing University, we have been running Turen Academy simultaneously. We plan to make it an international platform, aiming to train Chinese and foreign students together through short-term studios. 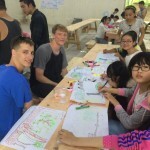 The permanent school site is in Xixinan, under Mount Huang. The school building was reconstructed from an historic barn. What we are doing recently is to foster a new generation of designers, who would contribute to Chnia landscape. We believe that this is more important than a concrete design project.